To understand the soul of subject & solve the questions within time by Short - tricks method. - OMR Sheet will be checked by OMR Machine. Do You Wanna Score Higher Than Your Boards In CA Foundation? 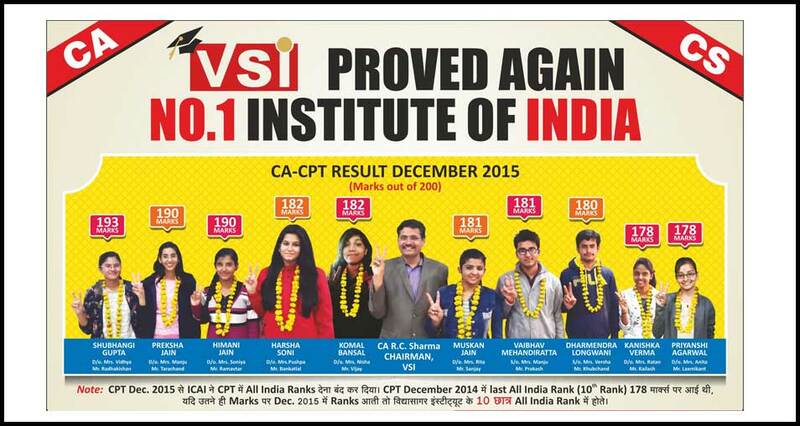 Till Now VSI JAIPUR's 7019 students got selections in CPT. 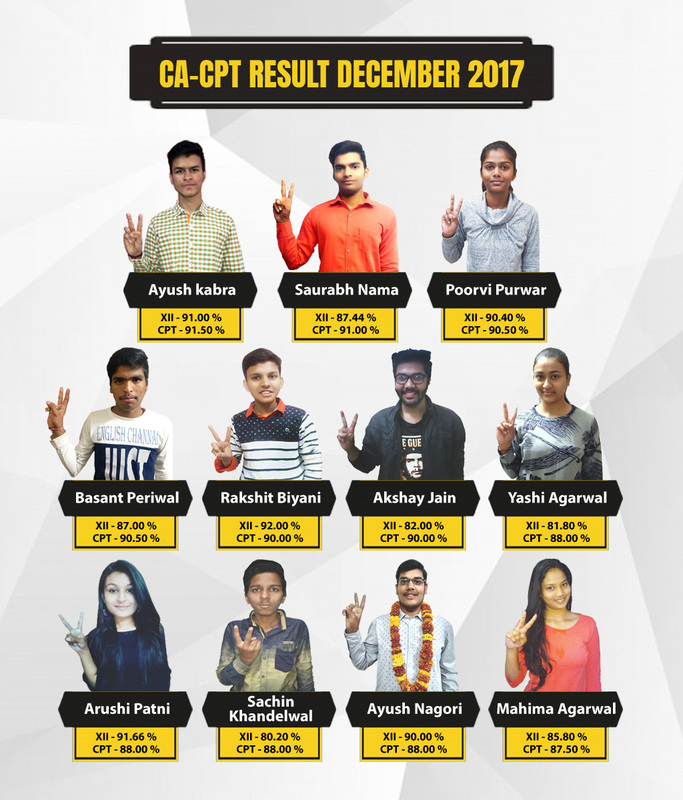 Our 14 students scored 90% and more, Mrinal Jain 97.50% ( 195 Marks ), Archit Agarwal 97.50% ( 195 Marks ), Supriya Kabra 95% ( 190 Marks ), Kriti Goel 94.50% ( 189 Marks ), Shivangi Agarwal 94.50% ( 189 Marks ), Pragya Jain 94.50% ( 189 Marks ), Shipra Pathak 94.00% ( 188 Marks), Sachin Agarwal 93.50% ( 187 Marks ), Khushi Agarwal 92.50% ( 185 Marks ), Rohit Agarwal 92.00% ( 184 Marks ), Nihar Khandelwal 90.50% ( 181 Marks ), Akshat Agarwal 90.50% ( 181 Marks ), Anchal Garg 90.00% ( 180 Marks ), Ujjawal Agarwal 90.00% ( 180 Marks ). Our 3 students scored 90% and more, Puneet Matha 92.50% ( 185 Marks ), Hirendra Lakhotia 91% ( 182 Marks ) and 1 student scored 90%, Krishan Khandelwal 90% (180 Marks). 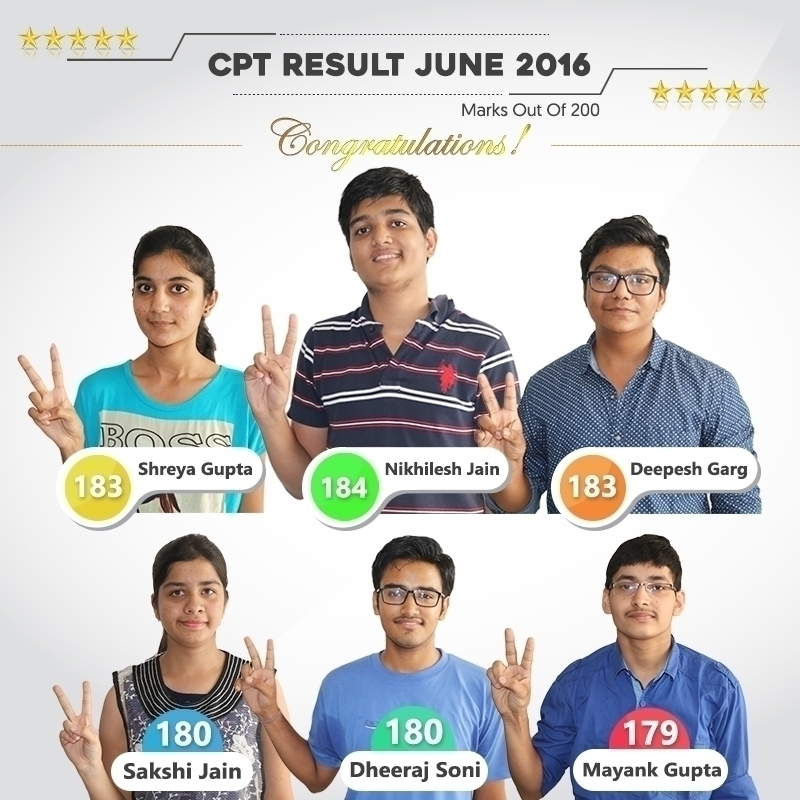 Our 5 students scored 90% and more, Nikhilesh Jain 92% ( 184 Marks ), Deepesh Garg 91.5% ( 183 Marks ) & Shreya Gupta 91.5% (183 Marks) and 2 students scored 90%, Sakshi Jain 90% (180 Marks) & Dheeraj Soni 90% (180 Marks). 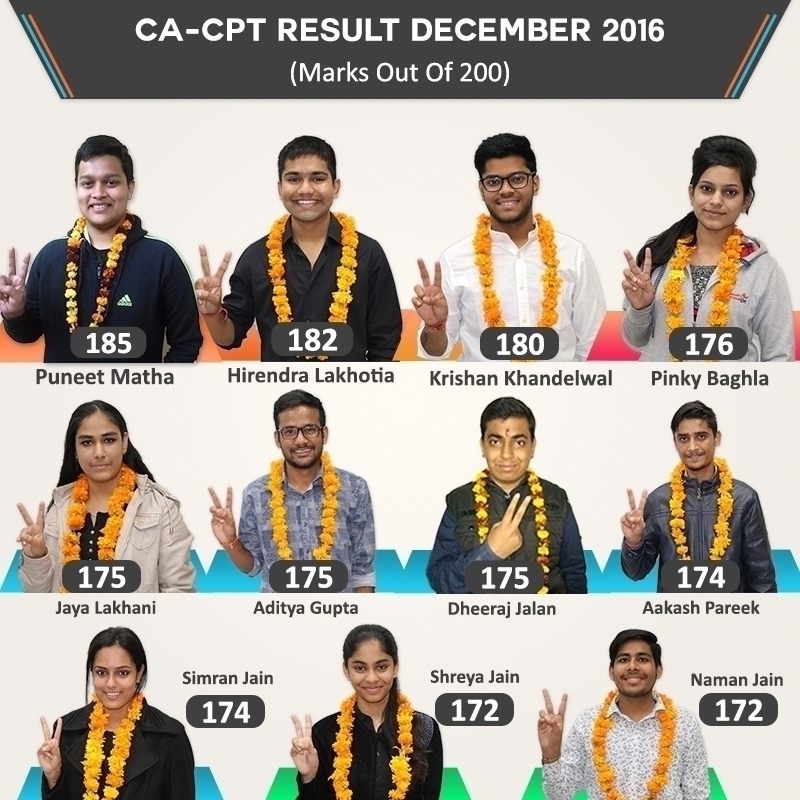 Shubhangi Gupta scored 193 marks, both Preksha Jain and Himani Jain scored 190 marks which are more than the previous All India Rankers. 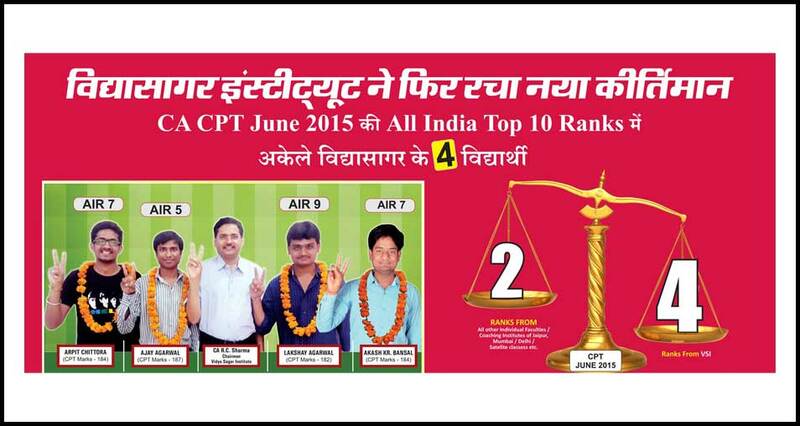 Not only this, our institute has the Record of giving at least 4 ranks in top 10 All India Ranks for the last 4 CPT examination and lot more top ranking records which you can check at our results section.The reason behind VSI Jaipur being the no.1 Institute of India and making all India top records in its all attempts is it`s complete focus on its faculty to make students understand each topic completely in the best manner.